Kale is a super healthy vegetable. It is full of vitamine a, c and k and even contains omega 3 fatty acid. On top of that, it is low in calories. These chips are super easy to make and give you that munch you crave during a movie. 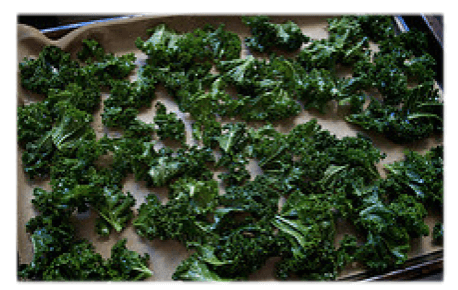 Remove the hard stems of the kale and wash them thoroughly, then dry in a salad spinner. If you don’t have a salad spinner, put a few leaves in a tea towel and (outdoors) spin the towel around real fast so that the the water “spins” out. In a mixing bowl, put one tbsp of olive oil or coconut oil (coconut oil is better with the heat) and cover the leaves of the kale. Tear the leaves into smaller pieces and place on a lining sheet and put them in the oven. The chips are done when the sides curl up. Pay attention though because there is a thin line between being perfectly baked and burned. This should take about 10 to 15 minutes. These chips go well with a yogurt/garlic dip or the crudite recipe.